"King Child confirms all the good we thought of his first album "Meredith" and refines the depth of his irresistible stylish pop"
The Franco-Belgian duo King Child had excited us with their first album "Meredith" released at the end of 2017. Taking advantage of the response generated by this first successful attempt, the group, which has consolidated with the arrival of a new musician, returns a little over a year later with a new album entitled "Leech". Before entering the content itself, it should be pointed out that the cover of the disc once again has a real aesthetic quality and that it is in a way complementary to the cover of "Meredith" in terms of colour, and this is precisely in line with the generally darker musical content of "Leech" compared to "Meredith". Everything is a question of nuances in reality because if King Child keeps the foundations of his writing, with always a fine balance between the synthesis of keyboards and modern effects and the organic of classical and vintage instruments, this time he makes his melancholic poetry lean towards more gravity. In "Meredith" King Child impressed us by his ability to write music with great virtues of sensuality. The compositions of "Leech" are even more directly addressed to the senses with harmonic assemblies of extra density (the saxophone of the throbbing "Carnival", the abundance of sound effects of "Maxillary Dysfunction") and more enigmatic developments in which the tension is very palpable ('Leech','Carnival' and'Big Brother'). In harmony with the music and to amplify the strength of certain passages, Quentin Hoogaert's singing has gained prominence by adding percussion ('The Man In The House') and the bewitching breath ('Carnival' and'Big Brother') to his already extensive palette. Once again, the charm works. 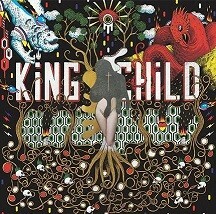 In just thirty minutes King Child demonstrates a sense of composition that has been affirmed in the expression of perspective and emotion. All these dimensions already existed in "Meredith" but they were set back by its power of pop attraction and its immediate approach. In "Leech" they reach a higher intensity.